Q-weak at Jefferson Lab has measured the proton's weak charge. (Phys.org) —Researchers have made the first experimental determination of the weak charge of the proton in research carried out at the Department of Energy's Thomas Jefferson National Accelerator Facility (Jefferson Lab). 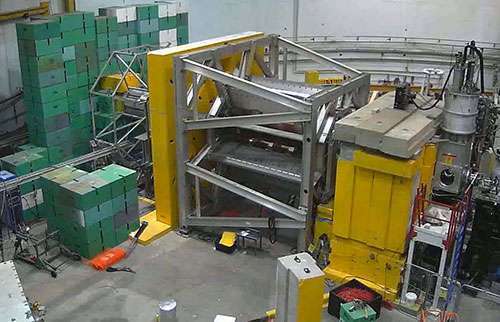 The Q-weak experiment was designed by an international group of nuclear physicists who came together more than a decade ago to propose a new measurement at Jefferson Lab. They proposed the world's first direct measurement of the proton's weak charge, denoted by the symbol Q_W^p; this represents the strength of the weak force's pull on the proton, a measure of how strongly a proton interacts via the weak force. Since the weak charge of the proton is precisely predicted by the Standard Model, which is a well-tested theoretical framework that describes the elementary particles and the details of how they interact, it is an ideal parameter to measure experimentally as a test of the Standard Model. To perform the experiment, the scientists directed a very intense beam of electrons into a container of liquid hydrogen. The electrons were longitudinally polarized (spinning along or opposite their direction of motion). Electrons that made only glancing collisions with the protons (elastic scattering, where the proton remained intact) emerged at small angles and were deflected by powerful electromagnets onto eight symmetrically placed detectors. The weak force is far weaker than the electromagnetic force. In classical terms, one might think of this as for every one million electrons that interact with the protons via the electromagnetic force, only one will interact via the weak force. Physicists measured those few weak interactions by exploiting an important difference between the two forces - the weak force violates a symmetry known as parity, which reverses all spatial directions and turns our right-handed world into a left-handed one. In an opposite-parity world, the electrons spinning with their axes along their direction of motion would interact with protons via the electromagnetic force with the same strength. Where the weak force is concerned, electrons with right-handed spin interact differently than left-handed ones. By keeping all other parameters of the experiment the same, and only reversing the polarization direction of the electron beam, scientists can use the difference or "asymmetry" of the measurements between two polarization directions to isolate the effect of the weak interaction. The goal is to measure this difference, only ~200 parts per billion, as precisely as possible. This precision is equivalent to measuring the thickness of a sheet of paper laid atop the Eiffel Tower. The initial analysis of the Q-weak experimental data yielded a value for Q_W^p that is in good agreement with the Standard Model prediction. However, the collaboration has 25 times more data than was used in this initial determination. The final result should provide a rigorous experimental test of the Standard Model, providing constraints on new physics at the scale of energies being explored at the Large Hadron Collider at CERN in Europe. "Readers should view this result primarily as a first determination of the weak charge of the proton. Our final publication will be focused on implications with respect to potential new physics," says Roger Carlini, a Jefferson Lab staff scientist and spokesperson for the Q-weak Collaboration. The Q-weak experiment was originally approved in January 2002. A nearly year-long installation period for experimental equipment began in 2009, which was followed by a two year period of data collection during 2010-2012. Numerous technical achievements in the last decade made this experiment possible. These include the high-current, high-polarization, extremely stable electron beam provided by Jefferson Lab's Continuous Electron Beam Accelerator Facility; the world's highest-power cryogenic hydrogen target; extremely radiation-hard Cerenkov detectors; ultra-low noise electronics to read out the signals and precisely measure the beam current; and a system which measures the beam polarization to better than 1 percent using a back-scattered laser. These technical achievements have yielded an astonishingly small total uncertainty of 47 parts per billion for the data published so far. More information: The results will be published in Physical Review Letters online on Oct. 13 and in print on Oct. 18. The weak force is one of the four fundamental forces in our universe, along with gravity, electromagnetism and the strong force. ….. The Q-weak experiment …. represents the strength of the weak force's pull on the proton, ….. which is a well-tested theoretical framework that describes the elementary particles and the details of how they interact, it is an ideal parameter to measure experimentally as a test of the Standard Model. We know its physical mechanism very well. Particles with weak charge interact with the fields of the weak force. This interaction can approximately be described by saying that a particle will change flavor, emit a W boson, and that W boson can then decay into other particles (predominantly leptons). Or the particle can interact with the Z field and just undergo momentum corrections from this interaction. The predictions from this model have matched data to an amazing degree. To claim we do not know its working mechanism is nothing more than the baldest of lies. One might as well claim we don't know why the sky is blue. @shavera, I think vacuum-mechanics was trying to say we can observe the interactions and as a consequence we can craft the Standard Model to provide the umbrella of mathematics. The fact is however, we don't know why it happens and in that detailed essence the fine mechanism of how it occurs is not known at all. Particles with weak charge interact.. But *Why* in that particular way is completely unknown, isnt that true ? I am ignorant here fellas, can you help? I thought that the weak force governed radio active decay and since the proton is not expected to decay (well, not within the present determined life of the universe...I think?) what does the above article mean? I understand that the weak force can affect particles but I don't think this article refers to this. Does the article show that the proton can take part in r.d. whereas previously it was thought not to? Any good 'links' that give decay path diagrams? The proton is part of the decay process. As in radioactive decay, protons are part of the emitted alpha particles (two protons & two neutrons) the weak force mediates the fission of large atoms splitting into several smaller atoms. It's also part of the fusion process where protons fuse to become heavy hydrogen (one proton & one neutron). So the yes the weak force does work on protons. He's not saying anything, he's just shamelessly plugging his site nobody cares about. So what will be the last thing in the universe to decay? Yeah I mean, in all honesty we'd all do well not to give attention seekers the attention they crave. I mean how ridiculous is it that we know Franklins=Teech2=Zephyr=AWT, cantdrive is an electric universe crackpot, Nickfromnyc is an AGW denier, and so on and so forth. They get their attention by saying ludicrous stuff and then forcing responsible people to reply with science. But the alternative would be to let the casual readers of the site browse through and see these claims about modern physics and think they might actually be true; or, god forbid, actually click through and increase traffic to their crackpottery online. Ah, they managed to work out that huge mistake they made early on in data collection. Very good. I don't generate any revenue with my blog - the PhysOrg does. If I'm grabbing attention of readers here, I'm just helping the PhysOrg site. you may not generate revenue, but you spread false information. information that CANNOT be proven. information that only you seem to be able to understand, and then you try to techno-babble someone to death with your continued writings, instead of providing empirical data, testable experiments, etc. if you cant prove it, then you are a crackpot. no matter how good your intentions. If I'm grabbing attention of readers here, I'm just helping the PhysOrg site. Woha. That's a seriously twisted piece of logic. You're the single most important hindering block to serious discussion on this site (and probably the single most important reason people leave it).